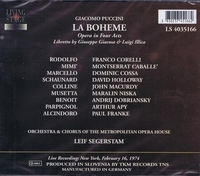 “Behind-the-scenes manipulations give this BOHEME broadcast of 16 February, 1974, an unusual aura. Pavarotti was scheduled with Amara as his Mimi. The Modena tenor cancelled. Corelli agreed to sing a rare radio Rodolfo, whereupon management, perhaps intent on making a high-powered splash, pulled Amara from the cast in favor of Montserrat Caballé. In a singular announcement as he opened the broadcast, Cross read a carefully worded statement, noting that Amara was scheduled, but ‘has graciously stepped aside’ in order to give her sister diva ‘the opportunitry of sharing her first Mimi’ with the broadcast public….Miss Caballé’s Mimis were indeed a rare item on the Metropolitan stage. Two seamstresses would be her tally…. During this period, Caballé is at the peak of her vocal form, notwithstanding the circumstances of her assumption of the role, one is grateful to have this lovely memento of her Mimi. The radio is kind to her….the memory one treasures of her seamstress is the exquisite delicacy, vocal and dramatic, of her portrayal. She paints most often in pastels, the vocalism is so pure, its liquid flow so ecstatically ethereal, that one feels its rarified air should be breathed only in a cloister’s walls….Caballé’s Mimi is refinement personified….no matter that this Rodolfo is Otello in a frock coat….At Mimi’s death, the tenor goes beserk, offering the most extroverted portrayal of grief in my memory; he fills the airwaves with a spate of interpolated ‘No’s and man-sized sobs….almost everything Corelli does on this afternoon seems outsized. There is nothing small about him - and for that, we can be grateful.